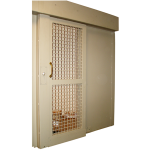 All Airteq Pneumatic products are designed for use by both Juvenile and Adult Correction Facilities in the following areas: inmate housing, entrances, corridors, safety vestibules and administrative areas. I want a solution compatible with low voltage PLC door control systems. I want to eliminate the need for auxiliary electrical components between the head-end and detention hardware. I want an energy efficient solution that will help reduce my operating budget. I want a product with a successful track record of installations in long term operation. I want to reduce life safety issues for the end user with immediate unlock reaction times, maximum side load capabilities and an adaptable group release system in case of power failures. I want a system that offers uninterrupted operation in case of power failures. I want a system that requires minimum maintenance with fewer moving parts. 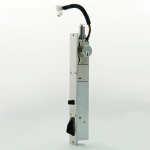 The Airglide 8210 is a pneumatically powered locking device designed for use in applications requiring remote unlocking and manual movement of sliding doors. 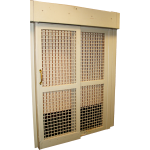 The locking system provides smooth, quiet operation with minimal maintenance. Low power requirement (24 VDC) provides substantial cost savings in electrical power distribution and controls. The Airglide 8250 is a maximum security locking device is designed with security foremost in mind. The door operator is contained in a securely baffled, continuous or individual, compact housing. Surface mounted locking column at rear of opening is of seamless, one piece construction to resist tampering. Provides for positive two point locking in both the open and closed position with automatic mechanical deadlock. The 9400 provides for pneumatic or manual locking / unlocking of swinging doors. It can be operated from a remote location or by key at the door. For additional security, it is recommended that the 9400 lock be used with an Airteq high security door position sensor. An automatic door closer may also be used. 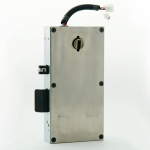 The Airlock 9500 provides for pneumatic or manual locking / unlocking of swinging doors. It can be operated from a remote location or by key at the door. For additional security, it is recommended that the 9500 lock be used with an Airteq high security door position sensor. An automatic door closer may also be used. 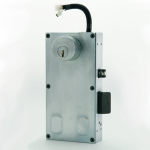 The 9500 provides for electric or manual locking / unlocking of swinging doors. It can be operated from a remote location or by key at the door. For additional security, it is recommended that the 9500 lock be used with an Airteq high security door position sensor. The 9500 provides a perfect solution for retrofit/modernization projects. Using the 9500 with a custom lock tube will allow for product upgrades without the need to replace doors and frames. 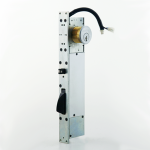 The 9600 provides for pneumatic or manual locking / unlocking of swinging doors. It can be operated from a remote location or by key at the door. For additional security, it is recommended that the 9600 lock be used with an Airteq high security door position sensor. An automatic door closer may also be used. 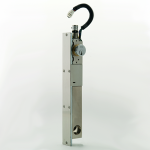 The 9700 provides for pneumatic or manual locking / unlocking of swinging doors. It can be operated from a remote location or by key at the door. For additional security, it is recommended that the 9700 lock be used with an Airteq high security door position sensor. An automatic door closer may also be used. The Airlock 9700P provides for pneumatic or manual locking / unlocking of swinging doors. It can be operated from a remote location or by key at the door. For additional security, it is recommended that the Airlock 9700P lock be used with an Airteq high security door position sensor. An automatic door closer may also be used.